Online since 2003, the IDFdesign website is a point of reference for furniture contractors. The website is developed with the ultimate goal of spreading a wide range of design solutions to the professionals who deal with large quantities of items. Restaurants, hotels, public institutions, banks, companies, airports are just a few examples of possible contacts or of possible destinations for the products displayed on our website. Our goal is to provide the best service, allowing the users to choose from a wide variety of products from the best furniture brands and at the same time allowing companies to display their products to millions of users around the world. All of the website content is daily synchronized on our APP: download it for free on the App Store and Google Play! 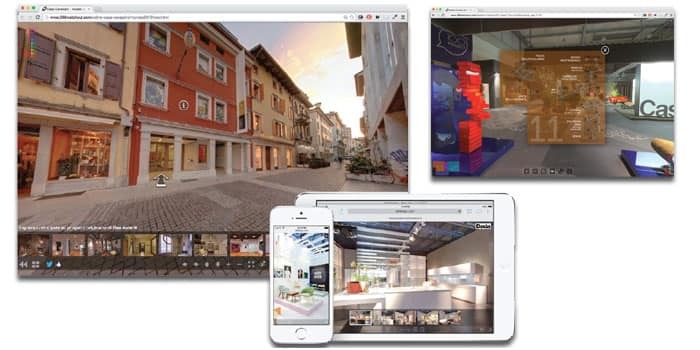 Thanks to our 360° virtual tours you can interact with the stands and the showrooms of the best furniture companies. Take a look at our portfolio and get involved into a fully interactive experience! Thanks to our database of users, we offer various types of DEM (direct email marketing) with the possibility of customizing the content and of choosing the recipients according to the user type and the geographical location.